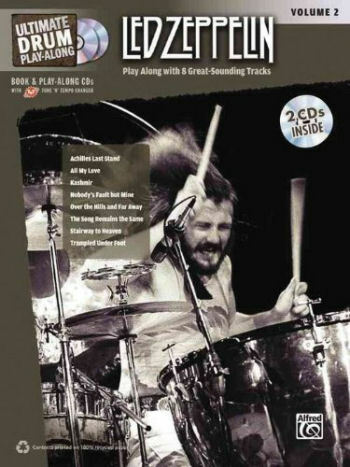 Tiger Bill Reviews Ultimate Drum Play-Along: Led Zeppelin Volume 2 from Alfred Publshing. This Ultimate Drum Play-Along book, with two CDs, features eight classic songs made famous by Led Zeppelin. The book includes accurate drum transcriptions, music notation, lyrics, and chords to each song. In addition to the song charts, drum-only charts are included with printable PDF versions on the CDs. The two CDs include two audio versions of each song - an instrumental sound-alike recording and an instrumental track without drums so you can play along. Used in a Mac or Windows PC, the TNT (Tone 'N' Tempo) Changer lets you access three version of each song: full-instrumental sound-alike, instrumental accompaniment with click track and no drums, and instrumental accompaniment without drums and without a click. The TNT software also lets you loop sections for practice and low tracks down or speed them up without changing the pitch. You can also change the key and switch between full-instrumental and play-along tracks. Very cool! This book and CD combination, another in the continuing Drum Play-Along series from Alfred Publishing, will be of great value not only to fans of drummer John Bonham and Led Zeppelin but to drummers of all styles and experience levels who are looking to improve their reading skills. It also provides lots of opportunity to practice playing along to a click track, which you'll find invaluable on studio sessions. And, at a retail price of $19.99 for the book with two audio CDs, this package is a real bargain.